On August 26, 1967 Major George E. Day was airborne over North Vietnam on a forward air control mission when his F-I00 was hit by enemy ground fire. During ejection from the stricken fighter his right arm was broken in three places and his left knee was badly sprained. He was immediately captured by the North Vietnamese and taken to a prison camp. Major Day was continually interrogated and tortured and his injuries were neglected for two days until a medic crudely set his broken arm. Despite the pain of torture, he steadfastly refused to give any information to his captors. On September 1, feigning a severe back injury, Major Day lulled his guards into relaxing their vigil and slipped out of his ropes to escape into the jungle. During the trek south toward the demilitarized zone (DMZ), he evaded enemy patrols and survived on a diet of berries and uncooked frogs. On the second night a bomb or rocket detonated nearby and Major Day was hit in the right leg by shrapnel. He was bleeding from the nose and ears due to the shock effect of the explosion. To rest and recover from these wounds, he hid in the jungle for two days. Continuing the nightmarish journey, he met barrages from American artillery as he neared the Ben Hai River, which separated North Vietnam from South Vietnam. With the aid of a float made from a bamboo log, he swam across the river and entered the no man’s land of the DMZ. Delirious and disoriented from his injuries, he wandered aimlessly for several days, trying frantically to signal US aircraft. He was not spotted by two forward air controller (FACS) pilots who flew directly overhead and later he limped toward two Marine helicopters only to arrive just after the choppers pulled away. Twelve days after his escape, weakened from exposure, hunger and his wounds, Major Day was ambushed and captured by the Vietcong. He suffered gunshot wounds to his left hand and thigh while trying to elude his pursuers. He was returned to the original prison camp and brutally punished for his escape attempt. On a starvation diet, the 170-pound man shrank to 110 pounds. He was refused medical treatment for broken bones, gunshot wounds and infections. Renewing the pressure to force Major Day to give vital military information, the North Vietnamese beat and tortured him for two days. Finally, he was bound by a rope under his armpits and suspended from a ceiling beam for over two hours until the interrogating officer ordered a guard to twist his mangled right arm, breaking his wrist. At this point Major Day appeared to cooperate with his captors, who felt that they had broken him at last. However, facing death if he was discovered, he deliberately gave false answers to their questions, revealing nothing of military significance. Two months after he was shot down, Major Day was transferred to a prison camp near the capital city of Hanoi. By this time he was totally incapacitated, with infections in his arms and legs and little feeling in his twisted hands. He could not perform even the simplest task for himself, but still he was tortured. Almost unbelievably, his commitment to utterly resist every attempt to gain military intelligence never wavered. By withholding information, despite the cost of personal suffering, he sought to protect fellow airmen who were still flying missions against the northern strongholds of the enemy. He did not fail. After five and one-half years of captivity, he was released with the other American prisoners of war on 14 March 1973. For his heroism he was presented the Medal of Honor by President Gerald Ford on 4 March 1976. 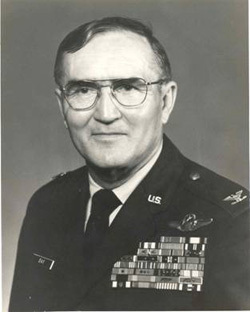 Colonel George E. “Bud” Day, USAF (Ret.) is the second-most decorated military member in American history, General Douglas MacArthur being the first.